Maxi 7M Supreme™ is probiotic in a capsule. Probiotics are live organisms (which need to be abundant) in your intestines to support assimilation of nutrients and infection prevention. 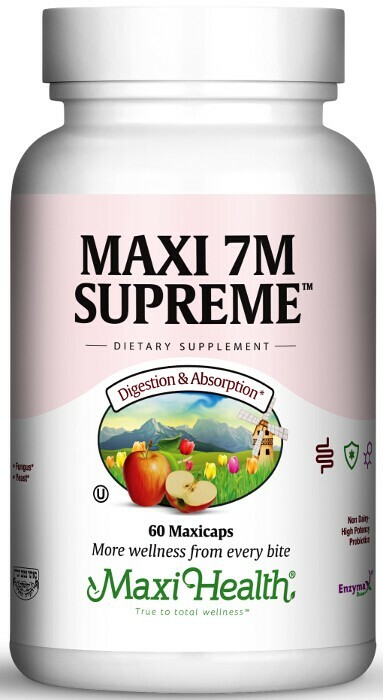 Maxi 7M Supreme™ has both of the most important probiotics that you need! Lactobacilius acidophilus (providing 1 billion culture forming units) and Bifidobacterium Bifidum (1 billion culture forming units) which can replenish and even enhance the correct quality and quantity of healthy bacteria lost. See the table below for how it is lost and what it means to have it restored. Apple pectin is included to support healthy digestion, promote normal elimination, and cleanse the intestinal tract of impurities. Let the Maxi 7M Supreme™ work for your family! Take two (2) Maxicaps™ daily before meals, or as directed. This product contains no animal products, soy, wheat, gluten, yeast, salt, milk, artificial flavors, colorings, or preservatives. Refrigerate after opening for maximum potency. I had repeated infections in urine and thrush. After starting to take Maxi 7M Supreme everything went away! Thanks for your products. Since the children and I take Maxi Chew-D-Max 1000 we have less colds. I take Maxi 7M Supreme to build up my immune system against yeast and allergies. I took 7M Supreme acidophilus for a yeast infection and it got rid of it. Thanks.